For the next six months we're based here in our own apartment. Not living out of a back pack! Cooking our own food! We're both working as English language assistants in high schools in Cannes. It's like teaching but with no responsibility and small classes. And only 12 hours per week of teaching. We only work Mondays, Tuesdays and Thursdays. My students are 16 to 21 years old and they're interesting and nice people. They even come to an optional extra class from 5 to 6pm on Thursdays! Lycee Carnot is beautiful and it's cool to see a different education system. James is at two schools, and I'll let him tell you about his colourful students. Now that everything is sorted though, life is sweet. We have internet at home, bicycles and two weeks of school holiday to explore the area a bit and for me to completely recover from shingles. So far we've managed to squander whole afternoons lying on the beach, but we're planning day trips to Antibes, Monaco and Grasse. As I said, life is sweet. Last week we invited a couple of other assistants round to our place for dinner. Picture a couple of Kiwis in the south of France serving chicken salad on paper plates to 12 people from Canada, Germany, Scotland, USA, England, Panama and Italy. And the only common language between all of us was French! It's amazing how quickly James' French vocabulary has expanded. I almost fell over when I heard him giving directions in French to an Italian who doesn't speak English. From the front door of our apartment (which is aptly named Casta Diva) you can look left and see Palm Beach, or you can look right and see Bijou Beach. Or you can go straight ahead past everyone playing petanque and go to the nudist beach on the end of the point. 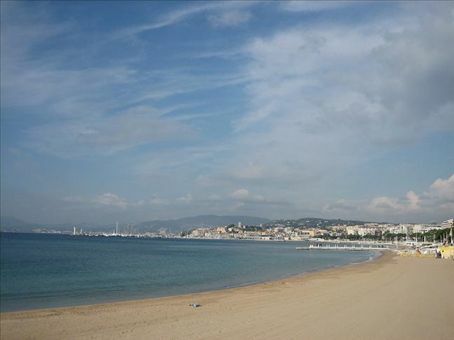 The town centre is a 5 minute bike away, or a half hour stroll along La Croisette. Think beach, palm trees and turquoise water on one side and designer boutiques and flash hotels on the other. Every expensive store ever invented is on La Croisette in Cannes. To get to the centre of town, we pass at least 30 boutiques (Dior, Gucci, Hermes, Chanel, Armani, Dolce and Gabbana, Chloe, Hugo Boss, Yves Saint Laurent - the list goes on). And then there is a random ice cream shop. $10NZ for an ice cream. Bargain. There are heaps of scooters and Smart cars due to the tiny streets (a Smart car is the tiniest car ever invented. It's as long as a normal car is wide). Most people don't bike. Also due to the tiny streets. Stuff in general is quite expensive, but not as expensive as London. People watching is fun as you can spot quite a few elderly, wealthy, overly tanned, designer-clad women with inflated breasts and lips and hair extensions, dripping in gold jewellery and toting little dogs around in their Chanel handbags. Best thing so far? Going to the boulangerie around the corner and coming home to eat fresh baguette and tapenade on our balcony with a glass of red wine. C'est la vie! Hi guys, Great to see everything is getting sorted - sooooo jealous! When is a good time to catch up on Skype? How old is too old to be an assistante? I think I've missed the boat...it sounds lovely. Hope the shingles weren't too bad. Salut mes amis! tres bien a recieve votre nouvelles! J'espere tous vas bien encore la! Il ecouter comme la vie parfait? Tous est tranquiile ici dans la sud de cette monde, hiver est presque finis, est le meteo est plus chaud. Mon jardin est comme une jungle de coriander et mesculin salad et les tomato et cucumber fait gross movement pour le ceil! J'ai fait quel que bon vol dans mon parapente dans wanaka dejas cette season et j'espere il est un sign de chose a arrive. Allors, je dois va a yoga maintenant, prende tous facile! Bonne chance et bon courage. Gerry. Hi you don't know me but your post came up in a google search I did. I am Australian and headed to France to teach English and you are doing exactly what I want to be going! I want to be in the south of France for the summer. However Im not sure of how yo find available jobs in Cannes and was wondering if you could offer some advice? A place for me to start. I have so many for Paris but I desperately want to be in Cannes. You sound like you've had an amazing time! I very much look forward to hearing from you soon.